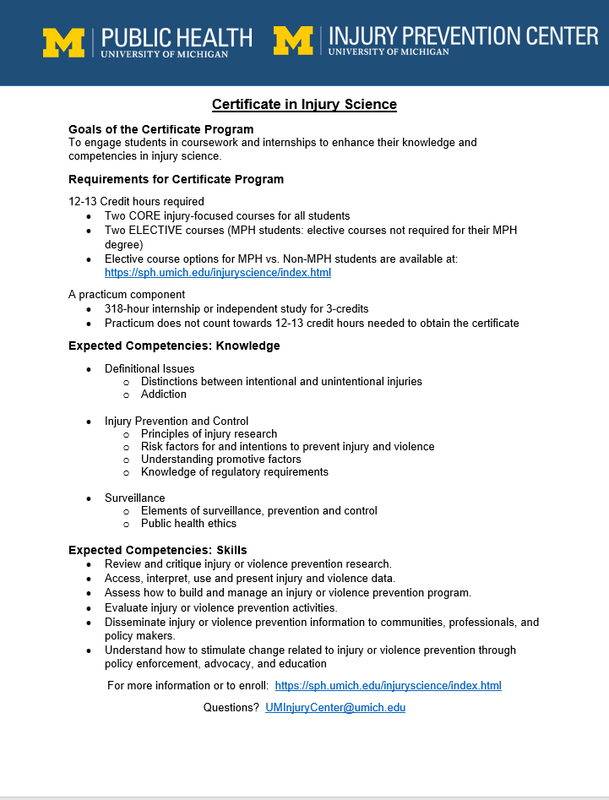 In partnership with the University of Michigan School of Public Health, the University of Michigan Injury Prevention Center offers a Certificate in Injury Science for U-M graduate-level students. To engage students in coursework and internships to enhance their knowledge and competencies in injury science. Training strategies include acquiring foundational content and methodological skills to use injury data and conduct policy analysis to increase an awareness of injury issues. Exposure to multiple disciplines, theoretical perspectives and cutting-edge methodologies to address the needs of vulnerable populations. Review and critique injury or violence prevention research. Access, interpret, use and present injury and violence data. Assess how to build and manage an injury or violence prevention program. Evaluate injury or violence prevention activities. Disseminate injury or violence prevention information to communities, professionals, and policy makers. Understand how to stimulate change related to injury or violence prevention through policy enforcement, advocacy, and education.